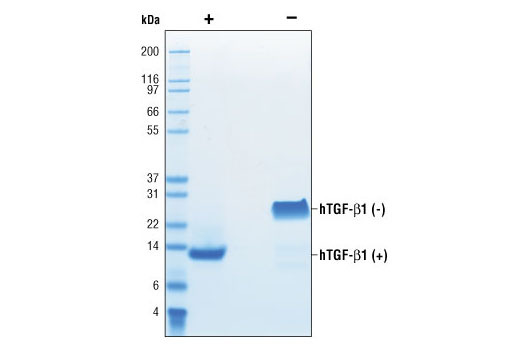 The purity of recombinant hTGF-β1 was determined by SDS-PAGE of 6 µg reduced (+) and non-reduced (-) recombinant hTGF-β1 and staining overnight with Coomassie Blue. The inhibition of IL-4 induced proliferation in HT-2 cells treated with increasing concentrations of hTGF-β1 was assessed. After 48 hour treatment with hTGF-β1, cells were incubated with a tetrazolium salt and the OD450 - OD650 was determined. 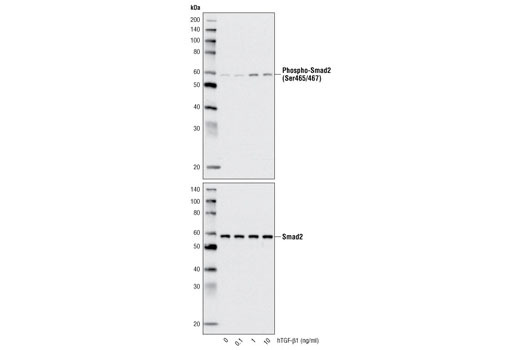 Western blot analysis of extracts from HeLa cells, untreated or treated with hTGF-β1 for 25 minutes, using Phospho-Smad2 (Ser465/467) (138D4) Rabbit mAb #3108 (upper) and Smad2 (86F7) Rabbit mAb #3122 (lower). Recombinant human TGF-β1 (hTGF-β1) Ala279-Ser390 (Accession #P01137) was expressed in human 293 cells at Cell Signaling Technology. >98% as determined by SDS-PAGE of 6 μg reduced (+) and non-reduced (-) recombinant hTGF-β1. Less than 1% migrates as monomer hTGF-β1 under non-reduced (-) conditions. All lots are greater than 98% pure. Recombinant hTGF-β1 contains no "tags" and the nonglycosylated protein has a calculated MW of 12,794. DTT-reduced protein migrates as a 13 kDa polypeptide and the non-reduced cystine-linked homodimer migrates as a 25 kDa protein. The expected amino-terminal ALDTN of recombinant hTGF-β1 was verified by amino acid sequencing. The bioactivity of recombinant hTGF-β1 was determined by assessing inhibition of IL-4 induced HT-2 cell proliferation. The ED50 of each lot is between 40-800 pg/ml. Less than 0.01 ng endotoxin/1 μg hTGF-β1. With carrier: Lyophilized from a 0.22 μm filtered solution of 20 mM citrate, pH 3.0 containing 100 mM NaCl and 20 μg BSA per 1 μg hTGF-β1. Carrier free: Lyophilized from a 0.22 μm filtered solution of 20 mM citrate, pH 3.0 containing 100 mM NaCl. TGF-β1 activities include proliferation, angiogenesis and promotion or inhibition of many immune events (1-3). TGF-β1 is produced by a number of cell types including regulatory T cells, fibroblasts, epithelial cells, and endothelial cells (3). TGF-β1 binds to TβRII homodimer, which then complexes with TβRI homodimer (1,4). The oligomeric receptor complex phosphorylates subsets of the SMAD proteins that then act to induce and repress a number of target genes (1,3,4). TGF-β1 binding can also activate the Erk2, p38, and JNK pathways via TAK1 (4). 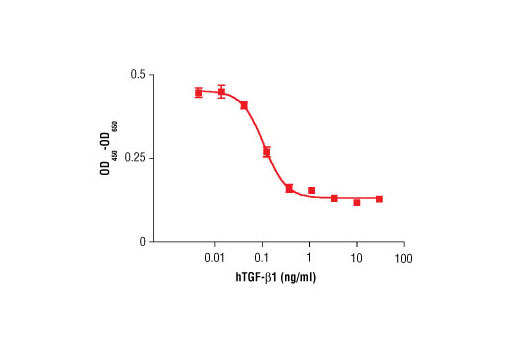 TGF-β1 appears to promote late stage progression and metastasis in some cancers (1,2). Siegel, P.M. and Massagué, J. (2003) Nat Rev Cancer 3, 807-21. Bierie, B. and Moses, H.L. (2006) Nat Rev Cancer 6, 506-20. Tian, M. and Schiemann, W.P. (2009) Future Oncol 5, 259-71. Moustakas, A. and Heldin, C.H. (2009) Development 136, 3699-714. Devine, D.J. et al. (2014) Oncogene 33, 2620-8. Yu, N. et al. (2015) PLoS One 10, e0133055. Min, K.W. et al. (2016) Oncogene 35, 377-88. Huang, Y. et al. (2015) Int J Mol Med 35, 311-8. Shi, X. et al. (2016) Proc Natl Acad Sci U S A 113, E4558-66. Mungunsukh, O. and Day, R.M. (2013) Mol Biol Cell 24, 2088-97.